Have you ever wanted your iPhone to be able to speak to you before? Well if you have then a new tweak was released into Cydia called Voice Notifications that can make this dream a reality. The tweak allows you to have your iPhone say just about anything when you receive a text message or phone call. Yep that’s right, with it you can actually program your iPhone (through the settings.app) to say just about anything you like when someones texts/calls you (Don’t have too much fun). All of Voice Notifications settings are configured through the settings.app, so you have no unwanted icons on your SpringBoard. If you are interested in this tweak, then you can find it through Cydia for a price of $0.99! It is 12:30AM at night, you have just fallen asleep and suddenly you get a text message… You go to grab your iPhone and are blinded by your iPhones screen glare! After recovering, you think to yourself… boy I wish there was a way to turn my iPhone’s screen brightness down even more. Well folks, if this sounds like you, you are in luck! 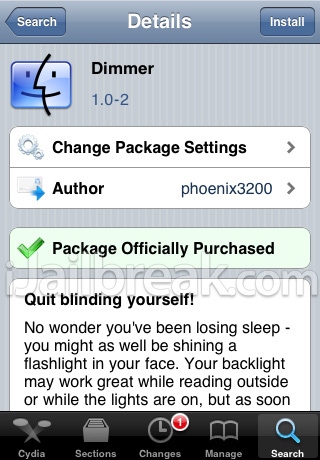 Dimmer is a fairly new tweak that was released this week that we have been dying to show you! This tweak will allow you to dynamically adjust your iDevice’s screen brightness much further then Apple intended you to. In fact you can decrease the brightness of your iDevice’s screen to almost the point where in normal light you cannot even see the screen. With the tweak installed you can control your backlight to its fullest extent! From 100% to 30%, your normal backlight will control your brightness and below 30% Dimmer takes control and lets your virtually dim your screen beyond what your backlight can do. If you would like the ability to use your iPhone at night, I think Dimmer is a must have tweak for all jailbroken users! You can find it through Cydia for a price of $0.99. Have you ever wished that you could have the ability to shape your iDevice’s SpringBoard icons? If you have, a neat new tweak was released into Cydia called Masks. What this tweak literally does is apply a mask to your iDevice’s SpringBoard icons, which means all of your iDevice’s icons can be uniquely altered without the need of WinterBoard. In more technical terms this tweak actually applies a simple black and white transparent image to all of the icons on your iDevice’s SpringBoard. Allowing the icons to be uniquely altered without any heavy drain on your precious battery life. Image masks can even be applied to your iDevice’s wallpaper to add some further customization! The tweak comes with more than 40 pre-made image masks that can be applied directly to your iDevice’s icons, or even better, create and use your own mask for either your icons or your wallpaper. If you think Masks would be a tweak that would interest you, you can find a more detailed demonstration of this tweak from a YouTube video. Furthermore, the Masks tweak is available through the Cydia store for a solid price of $1.99. Which in my opinion is a good price for a tweak of its caliber. Wouldn’t it be nice if you could quickly browse through your iPhones contacts relevant to the phone number you are dialing? Well now you can thanks to a new tweak that was just released into Cydia called PhoneHint. This new tweak for your iPhone allows you to search through your contacts by swiping left / right over the dialer’s number display. You can then select and call the contacts number you were looking for by double tapping it. If this is functionality that you would like to see on your iPhone, this is one tweak that you won’t want to miss out on! If your interested in PhoneHint, it is available through Cydia for a price of $1.99. @Tr1pTr0p whats that called and when is it coming out it looks awesome!!! Looks cool. Send me an email if you would like us to write a post. Its not really a tweak or an add-on (that I know of). Its just a mock-up picture I made in hope that someone would turn it into a reality.